If anything is to be said about the world of digital marketing, it is that there’s always something happening. It’s true to say that 2013 certainly lived up to that premise and was a very eventful year. We saw a number of interesting occurrences – some were good, some were bad and some were downright ugly. So, let’s take a look at the year that was in this quick recap. One of the big changes of 2013 was in attitude. 2013 put to rest queries over whether you needed to be on social. Instead businesses were thinking, how we can make the most of social. This saw some absolutely awesome high profile campaigns. Some were planned and some weren’t. Oreo’s ‘You can Still Dunk in the Dark’ effort was probably our highlight of the year and made the most of the Super Bowl’s faulty power line. Other notable efforts came from Breaking Bad and this brilliant hybrid effort late on in the year from KitKat in conjunction with Android. The last year saw a number of new social media sites hit the mainstream, as well as come to fruition. Vine was unveiled by Twitter in January and initially saw significant success. The 6 second video clip site was then followed by an Instagram short video alternative in June. MySpace also made an attempt at a comeback and had a complete redesign and what seemed like plenty of vigour to rekindle itself as a top dog. Bebo followed suit too with a witty self-depreciating come back video, though neither seem to have made the cut. Tumblr went from strength to strength and was bought by Yahoo, while Reddit and Snapchat also featured quite prominently too. Pinterest saw increased success and also began to shed its feminine image somewhat – it also began its monetisation effort with the introduction of sponsored pins. Twitter’s now a big grown up and had its seventh birthday in 2013. It played an important role in a number of the big events throughout the year, including the hunt for the Boston Marathon bombers among other political issues. The site’s IPO was also a huge success and saw significant appreciation of its share value almost immediately after it was up and running. Twitter also added a number of changes to the way it does business, adding several marketing aspects to its arsenal including promoted posts and now also showing images directly on feeds. The arrival of the Lead Generation Cards was a big step too and something that will become especially important in 2014 as Twitter pushes to make ad spends work more efficiently. After a less than successful IPO in 2012, Facebook made up a lot of ground in 2013. Its share price also pushed back up past its original valuation. It also introduced a number of added aspects to its game and social search and its Graph Search were the big talking points. Facebook was now a search engine of sorts and allowed people to search and find terms, updates, check-ins and pages through friends and friends of friends. It also launched clickable hashtags – something once reserved for Twitter. Its Newsfeed also received a number of tweaks and changes, many of which pushed images to the fore and promoting more visual content. We also need to remember it also owns Instagram and this could be a contributing factor. The site also introduced the 20% text rule to cement this change in large pictures and less text. It also released its Facebook Home app, though the less said about that the better. Google gave Google+ a redesign and added a new layout. It also added a related hashtag feature – something many feel was a real push by Google to catapult Google+ to the social media front ground. A new unified Dashboard was added to make marketers’ lives that little bit easier. Expect Google+ to become increasingly prominent in 2014 and also even more of a focus on Authorship. The world’s largest search engine underwent a number of major alterations in 2013, releasing a zoo full of algorithm updates to the way it calculated search rankings and causing turmoil for many online businesses. It also released its Hummingbird algorithm change later on in the year – a sign of things to come and of the growing importance of Schema mark-up and semantic search. The company also retired its Google Reader, but also bought a wave of companies and released its Google Glass to the world. It then announced its entry into the health care area and introduced a new tabbed Gmail inbox – showcasing the increasing arbitrariness of its interests. Android continued its rise and saw a number of updates, the latest of which was Google Android KitKat 4.4. Apple had a quite good year, though one without a little disappointment. The company saw its new iPhone 5S acclaimed as a leap forward, while its new IOS7 was also seen as a good update. The lower costing iPhone 5C however didn’t seem to hit the mark to the same degree. For its iPads, it seems it was business as usual, with a number of new updated and slightly altered incarnations released. Mobile search and smart phone use increased again in 2013 as devices fell in price, 3G connectivity improved, while 4G connectivity became more widespread. Cyber Monday was a good example of the yearly trends in one instance. Web sales rose by 21% year on year for the day in question, while mobile traffic grew 45% year on year accounting for almost a third of visits. This accounted pretty much for 2013’s mobile use in a nutshell. So, all in all, 2013 was an awesome year in digital marketing. 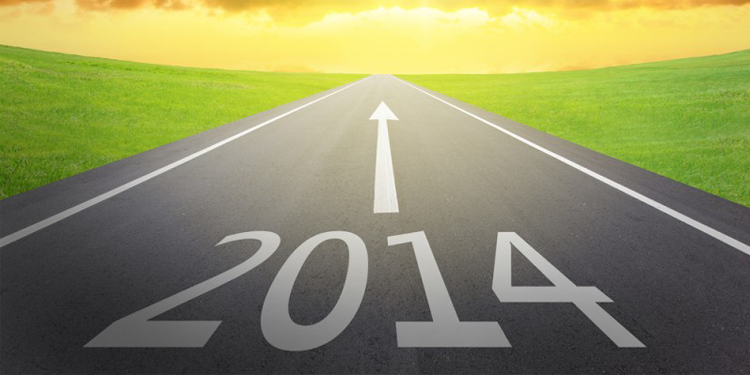 Here’s to a great 2014 and Happy New Year to all our clients and friends.